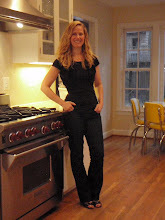 I know what my friend Tricia (aka Crock Pot Gal) is saying right now, "What the H-E-Double Hockey Sticks!" 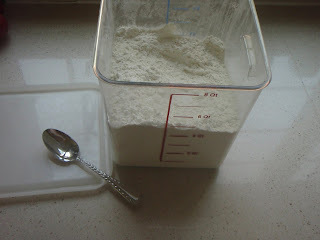 I know, I know...you want more recipes and here I am telling you how to properly store and measure flour. But really, this is soooo important! As you can see in the picture above, I store my flour in a lovely 8-qt container. This container is airtight so it keeps the flour fresh. You can find these at The Container Store. Another great feature of this container is the width. 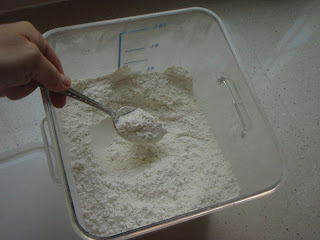 Having a large opening makes it easier for me to spoon and level off the flour over the top so the excess flour falls easily back into the container. Now tell me.. be honest now.. you just scoop your flour right out of the bag, don't you? AND it goes all over the counter, right? Yeah, well, that's a shame. I would like you to try storing it in a container that will allow you to properly measure your flour. If you don't bake as much as I do get a smaller container. 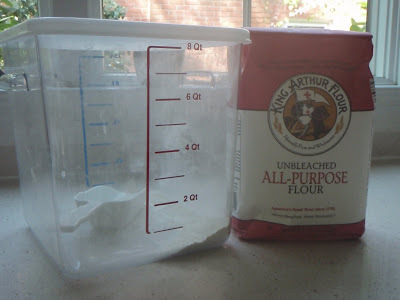 I have added the new bag of flour to my container and now I am ready to measure! 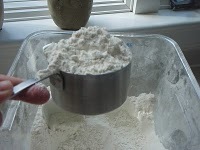 First, stir up the flour a little as it has settled and needs a little "wake up". 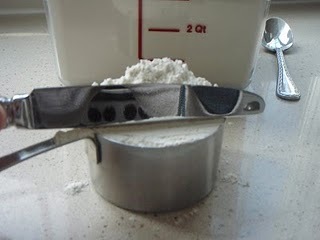 Third, put your spoon down and pick up your straight edge so that you can level off the excess flour. This is what I mean by "level off the excess with a straight-edge". Do this over your container --put your spoon down and pick up your straight edge and level off excess flour over your container. IMPORTANT NOTE: Since this task requires that one use both hands I was not able to hold my camera and take a picture of the technique of leveling off the excess flour over my flour container! I had to put the measuring cup on the counter --do not do this! Never tap the measuring cup with your knife or spoon OR on the counter. This may cause you to have excess flour.